Denver Apartment Buildings For Sale website is proud to release our neighborhood statistics in the Central Denver Apartment Market Report by Kyle Malnati. Take a look at the Capitol Hill apartment sales market (below) as well as my other blog posts for the following neighborhoods: Congress Park, Uptown, and Washington Park! Kyle Malnati’s Central Denver Apartment Market Report for 2Q2012 details Apartment Buildings Sold in Denver during the 4th Quarter of 2011 and the 1st Quarter of 2012. The statistics for Capitol Hill Sales are 9 properties sold: Averages – $124.16/SF – $108,604/unit. The Capitol Hill neighborhood of Denver is described by the following: Bounded by Broadway, York Street, Colfax Avenue, and 8th Avenue. The detailed information about each apartment building sale can be found below or in my latest newsletter. The purpose of the Central Denver Apartment Market newsletter is to provide insight on the direction of the market, and to recap the apartment transactions that occurred in the 4th Quarter of 2011 and 1st Quarter of 2012 in Central Denver’s neighborhoods. This newsletter is the 22nd issue of a quarterly publication that focuses exclusively on the apartment market in Central Denver. 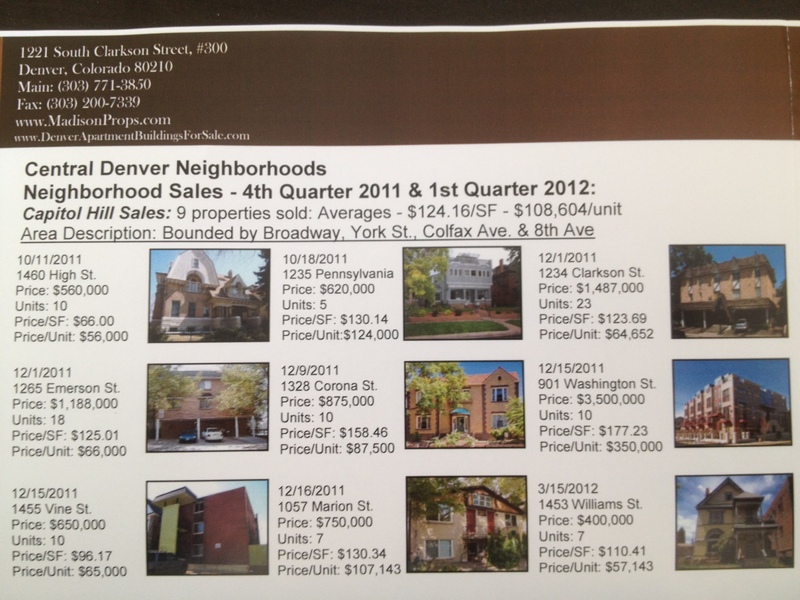 Central Denver Apartment Market Report is an ongoing service provided by Kyle Malnati.